CEC also offers the CD5, a full-facilities player based around the same single-belt transport used in the TL5, one that sits surprisingly adjacent to the transport in terms of price. On paper at least, that makes it a tempting alternative, even if only as a standby option in a DAC-based system. Unfortunately it’s not quite that simple. The CD5 does more than just add a DAC to the basic architecture of the TL5. Like most CD players on the market these days, it also offers USB, co-axial and digital inputs, as well as a headphone output (with its own, dedicated volume control) and both balanced and single-ended analogue outputs. 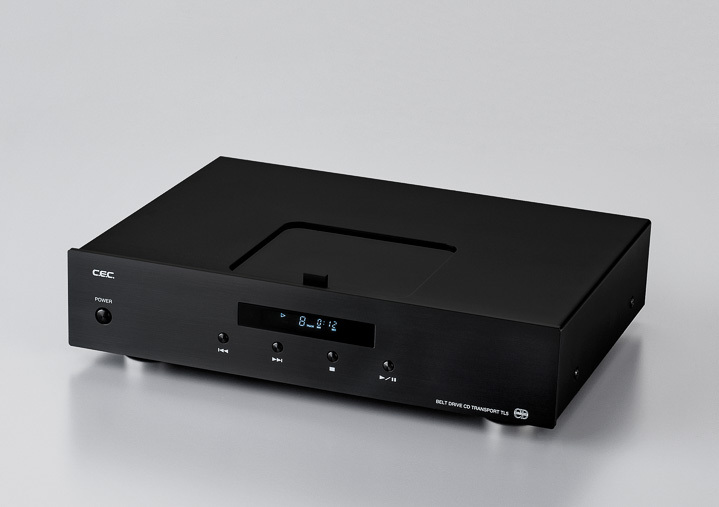 All that extra hardware comes at a price: the CD5 offers no AES/EBU digital output, which although I found myself preferring the TL5’s co-axial option, is still a very worthwhile facility that will definitely play in certain systems. It also ends up sharing its power supply across all those extra functions. Try using the CD5 as a transport and the TL5 buries it, offering greater detail, transparency, dynamic range, and a superior sense of musical flow... the whole point of owning a dedicated transport in the first place. Used as a CD player, the CD5 puts in a creditable performance for its reasonable price, one that’s full of musical life and energy. Just don’t confuse it with a dedicated transport like the TL5, or you’ll be selling your system short. Take a look at the TL5 though, and it becomes apparent that it ticks an awful lot of boxes when it comes to top-flight CD replay. Since the dawn of digital disc, the top-loading transport has been an almost ubiquitous part of the best performing players. Even those state-of-the-art disc players that use drawer-loading mechanisms are internally arranged to mimic a top-loading topology. But there’s no drawer and the TL5’s simple sliding cover eliminates not just the drawer but the motors and circuitry associated with mechanical loading. Likewise, belt-driven CD mechs have built an enviable reputation, being used in some of the best and most musical CD replay systems. Putting the DAC in a separate box also removes all the noise generated by the decoding process, as well as protecting it from the vibration and electrical interference generated by the transport and its various servos. Of course, you only realise those potential benefits if you can maintain data integrity when the signal passes from one box to the other. CEC provides an AES/EBU connection via XLR and a TosLink optical. They also include an S/PDIF co-axial connection, but inexplicably it’s via RCA rather than BNC – one of the few serious criticisms I have of the TL5’s physical arrangements. Other than that, it’s all business: four push buttons for basic transport functions; a simple, moulded remote that offers comprehensive functionality; a manual transport cover and a large diameter puck/weight to keep the disc in place. The thing that kept the TL3-N in my system for so long was the combination of temporal and dynamic expression it brought to music, qualities that so often escape many of the most expensive and heavily engineered digital replay solutions. Light on its feet, it managed to offer pace and momentum, while also allowing performers and performances to breathe. When any company withdraws a much-loved product, its replacement is always met with a degree of trepidation – especially when it’s claimed to be both better and cheaper! Thankfully, even the briefest listen to the TL5 demonstrated that I needn’t have worried, as it immediately displayed a beautiful sense of pace and timing, musical shape, and structure. Its ability to separate both spatially and tonally was better than the TL3-N while it also offered a greater degree of textural and acoustic detail. The music of Sibelius, with its fractured, kaleidoscope structure, interlocking instrumental voices and hesitant tempi has long been a challenge to the most accomplished of conductors, let alone the average CD player. Yet it presents the perfect opportunity for the TL5 to strut its stuff. Barbirolli’s reading of the 2nd Symphony is masterful and the CEC (driving Wadax, Wadia, or Mytek DACs) delivered every last ounce of his beautifully structured sense of purpose and authority, scale, and drama. The crescendos built, inexorably and without stumble or constraint, the pauses were positively pregnant. This is music making with gusto, a performance with an almost irresistible sense of ebb and flow that starts with Barbirolli but finishes, emphatically with the CEC. After that, the sort of kick required to bring rock or pop to life, the subtle texture and intimacy to make a vocal connect, or keep track of an extended instrumental line – they’re all child’s play. If you really want to hear what this transport does, just choose something that depends on phrasing and compare its performance to the competition. Whether it’s Argerich or Arvo, Ella or Eminem, the way the CEC flows effortlessly through the music makes most alternatives sound clumsy and disjointed, mechanical and stilted. Of the available outputs I found the S/PDIF lighter and livelier, more transparent and engaging than the AES/EBU, which while impressively solid and stable also sounded a little dynamically flat and distant. Other systems and other listeners may disagree, but I loved the extra air and immediacy that came from the coaxial connection – which somewhat invites the question as to how much better it might be with a BNC socket instead of the RCA?